Dr Trevor Horan (Chiropractor) has always been passionate about helping people improve their health and achieving goals. Prior to becoming a chiropractor Trevor worked in the world of health and fitness. A qualified swimming teacher, fitness instructor and personal trainer, Trevor has worked up and down the UK helping to inspire people to change to healthier lifestyles and create positive health habits. My last position in pre-chiropractic life was as Head of Fitness for a chain of large health clubs. Whilst in this role I met a couple of chiropractors who were health club members. I was amazed and fascinated at their ability to assess people on sight, and was often in awe when hearing tales about their work from satisfied patients who had been treated by them. A short visit was arranged for me to watch them at work in their clinic and I instantly knew that I wanted to become a chiropractor. The rest they say is history. I studied for my 4 year chiropractic degree at the University of Glamorgan and graduated in 2004. Following graduation, I never made it back over the border as I met a welsh girl, who is now my wife. 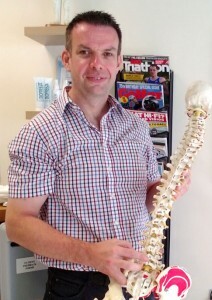 After working in clinics in South Wales I decided to open Cymru Chiropractic Clinic. Torfaen was chosen because there had never been a registered chiropractor here before. Initially it took a while for people to learn I wasn’t a ‘rub man with a magic sponge’, but since then it has gone from strength to strength. It is immensely satisfying to see the improvements in people and wonderful to see their confidence in us by referring their friends and family. Health is Yours for the Taking! I firmly believe that we all have a responsibility for our own health, after all if we don’t look after ourselves, who will? With each and every patient, we strive to treat the cause not just the symptoms and get the patient to understand that prevention is better than cure. Thank you for visiting our site. I look forward to meeting you in person and learning how we may be of service to you. Give our office a call or email me and lets arrange a time for you to start seeing how chiropractic care can help you and your friends and family.